Sits on top of your existing desk converting it into a height adjustable desk. Gas-assist lift with infinite standing height adjustments. Three integrated cable management grommets. 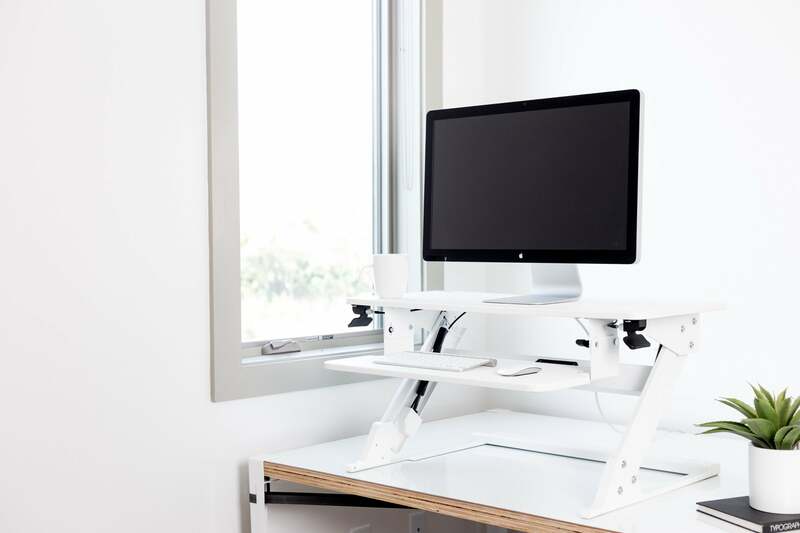 The UPDESK EasyUp is the fastest way to turn any desktop surface into a height adjustable standing desk. The EasyUp Corner 42 arrives fully assembled and requires no tools. Simply unbox the EasyUp and it’s ready to go! With it’s gas-assist lift, you have an infinite number of sitting or standing positions at your fingertips. Unlike its competition, the EasyUp Corner 42 weighs only 42 lbs, so it’s easily mobile and able to be set up by a single person. Its sleek design ensures that it can sit on any surface that’s at least 24” deep and can accommodate up to two 24” monitors (or a 27” monitor and a laptop). As an added bonus, the keyboard tray can tilt both negative and positive (up and down) to maximize its ergonomic comfort and comes with an integrated grommet hole in the rear-center of the unit for optimum cord management. Pricing breaks can be extended for bulk/volume orders of more than 10 units in a single order (**see below for more information). The UpDesk EasyUp is available in both black and white. Ships fully assembled - requires no tools. Supports up to 35 lbs on it’s upper deck. For volume order inquiries, click here. How large is the UPDESK EasyUp Corner 42? The UPDESK EasyUp Corner 42’s desktop footprint is 42” x 37.8” x 6.2” at its lowest setting. The upper deck can lift a total of 35 lbs 20” off of your desktop when at its highest setting. The keyboard rises 14.6” off of your desktop at its highest setting. The upper deck’s surface is 42” x 23.7” and the keyboard tray is 26.4” x 7.5”.